In what would have been the match of the night, Charlotte Flair turned heel and disqualified herself in the process. 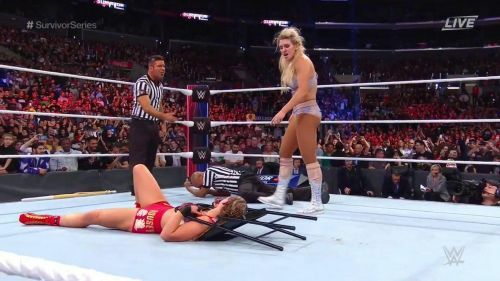 While it can be argued that this didn't need to happen, you can admit that it definitely added to the drama aspect during her match with Ronda Rousey. With or without the heel turn, the encounter itself was still jaw-dropping and an amazing watch. It was evident from the start who the fans wanted to see here - with their constant Becky Lynch chants filling the arena. To the pair's credit though, the fans eventually came around with a "THIS IS AWESOME!" chant as things really picked up. Ronda suffered the wrath of an unsympathetic hometown crowd. Not her fault either, the dramatic beatdown was most likely conjured up as a last-minute effort to make fans empathetic with her situation, as she had her sights set on facing Becky too. To say that this method never works would be an understatement. It failed when Braun Strowman tipped over the ambulance with Roman Reigns inside, and it proved unsuccessful again on this occasion. On top of that, she had nothing to do with the fact that Lynch was actually injured. Fans gave Rousey a hard time as a result - it was clear what they wanted on this occasion. The question here is, what's next for not only Charlotte, but Ronda too? It will be interesting to see Charlotte's attitude towards the rest of the SmackDown Live roster - while Rousey addressing the WWE Universe after being humiliated the way she was here, promises to be an intriguing watch too. If people were not tuning into SmackDown prior to Survivor Series, this will definitely provide a bit of momentum going forward for the blue brand. Although they were swept 6-0 and we'll unfortunately have to wait for a Lynch/Rousey match after all, the bright side is it's entirely possible these two will have a rematch in the not-too-distant future. With the comprehensive beating Ronda received, this feud certainly isn't over - not by a long shot.